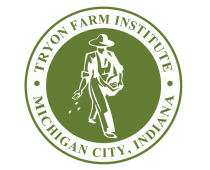 TFI recently hosted a Tryon Farm property tour for a group of landscape architecture graduate students from Ball State University. On October 2nd, 2012, landscape architecture graduate students from Ball State University set out for a five-day field trip exploring landscapes and spaces in Indiana and Michigan. The trip was part of the curriculum for the course Principles of Landscape Architectural Design, which introduces three related core concepts and experiences: the processes of design, the studio as format of learning and production, and the ideas and elements of landscape architecture. Carla Corbin, Associate Professor in the Department of Landscape Architecture, led first-year graduate students Nicole Rebeck, Nathaniel Gray, Bella Zhou, and Kristopher May on their annual trip, where Tryon Farm was their first stop. Scott Kuchta (TFI President) gave a tour of the lands and explained the history of land usage and design philosophy employed by the Noonan development family as they converted the property from an old dairy farm into a contemporary, sustainable housing community and open-land preserve. Professor Corbin can be reached at cicorbin2@bsu.edu for more information. Michele’s photos are wonderful. On a cold November night, summer looks pretty inviting!